You start as a young pilot in the battle of France over Verdun that happened in year 1916. 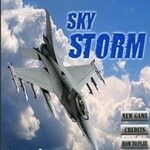 Hostile Skies is a simple and dynamic mid air combat game in which you take control of a World War 2 Fighter plane with the purpose to destroy all enemy planes. Use Left mouse to shoot fire and space to drop bombs.